Terra is a young woman that has lived under the care of the Gestahlian empire for some time, manipulated by handlers via a . 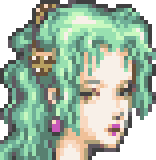 As the game opens, Terra is leading an Imperial attack on Narshe to seize the frozen Esper; when Terra, , and find the Esper, a strange reaction occurs, Terra's Magitek armor is destroyed, and she is rescued by Arvis. Not long after Arvis removes Terra's restraint, Terra meets Locke, Edgar, Sabin, and Banon, and becomes a key part of the rebellion against the Empire. Terra is able to naturally use magic without Magitek armor or implants, which is about as shocking as news gets within the world of this game. Terra has very high Magic, but is around average in her other stats. Terra learns a few spells without the aid of Espers, is able to equip heavy armor and most sword and dagger weapons, and is a teammate for the entire first half of the game except for exploring Zozo and the assault on the Imperial continent. Her Morph skill doubles her physical and magic damage inflicted and halves her magic damage received. Morph only lasts a short time, and its activation and time limit are determined by Terra accumulating Magic AP in combat. Terra is also one of the two characters who can learn magic organically. These are the spells she can learn as she levels up. When Terra uses Trance, she changes form for a while. When Terra is in Trance, she will do twice as much physical and magical damage, and her damage from all non-barrier-piercing magical attacks will be reduced by half. Being in Trance is only temporary, and will wear out in time. The length of the time she can stay in Trance depends on the amount of Magic AP she receives (unlike other characters, she will also receive Magic AP if she isn't equipped with an Esper or piece of equipment that teaches spells). The minimum value of the Trance bar is 0, the maximum 256. Her Trance counter will increase by double the amount of AP earned. You can't Trance if the Trance bar has value 16 or lower. In other words, her Trance bar depletion effectively becomes twice as slow later in the game. Long story in one sentence: Terra gains Trance energy from Magic AP and loses it when she's in Trance status, so try to save up on your Trance energy for particularly tough battles.